Las Vegas, Nevada (March 27, 2017) – Fandango, the leading digital network for moviegoers, is significantly expanding its focus in Latin America, one of the world’s fastest-growing theatrical film markets. The company announced today at CinemaCon, the annual convention for theater owners, it is rolling out a new global brand strategy that includes the release of innovative new ticketing destinations at its subsidiaries Ingresso.com in Brazil and Fandango Latin America, formerly Cinepapaya, in seven key countries in Spanish-speaking Latin America. Fandango made its first move internationally in November 2015, acquiring Brazil’s No. 1 online ticketer, Ingresso.com. In December 2016, the company acquired Cinepapaya, expanding beyond Brazil, into seven new countries including Peru, Colombia, Argentina, Mexico, Chile, Ecuador and Bolivia. This April, Ingresso.com will be launching a brand new website and mobile apps for Android and iOS focused on serving moviegoers. The experiences will offer enhanced search and browser capabilities and a new streamlined checkout process, making it faster and easier for consumers to discover movies and purchase tickets to the cinema. They will also offer a variety of digital payment options including PayPal, Visa Checkout and Masterpass. The sleek new design, modern logo and colors reflect Fandango’s global brand identity, which is being introduced across Latin America. Like Fandango in the U.S., Ingresso.com is looking to serve moviegoers wherever they are thinking about and looking for movie information. Recently, Ingresso introduced new technologies that enable strategic partners to integrate the company’s showtimes and ticketing directly onto their platforms. For example, the company executed a social commerce program with Facebook and Universal Pictures that incorporated Ingresso’s ticketing for “Fifty Shades Darker” on the Facebook platform. To help drive more Brazilians to the cinema, Ingresso.com is also launching a new promo code business that will help brands and studios connect with consumers through movie ticket rewards, promotions and loyalty programs. Ingresso will be leveraging the expertise of the U.S.-based Fandango Rewards business, which has been running movie ticket promotions for over a decade with leading brands and companies in a variety of industries, such as consumer packaged goods, telecommunications, financial services, quick service restaurants, and others. 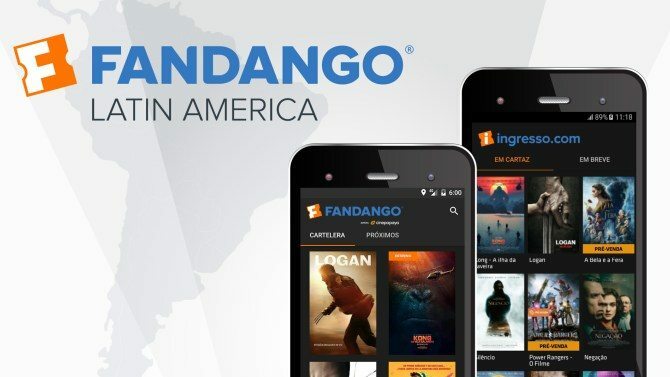 Fandango Latin America (fandango.lat), formerly Cinepapaya, is debuting its new digital platforms in Peru, Colombia, Argentina, Mexico, Chile, Ecuador and Bolivia, and will be supported by a consumer marketing campaign. In addition to rolling out new ticketing conveniences, the company will offer even more original and exclusive content for movie discovery. For example, the company will be launching a Spanish language version of “Weekend Ticket,” a weekly digital video series published by Fandango in the U.S. to help consumers with their moviegoing decisions. In 2016, Cinepapaya grew its screen count 92% and has already more than doubled its ticketing business in the first quarter of 2017 (year-over-year). In addition to expanding its coverage across the region by adding more theaters and screens, the company will continue to innovate on behalf of its exhibitor partners. With the goal of driving more consumers to the cinema, Fandango Latin America plans to help exhibitors stay ahead of the latest technology and social media trends. Fandango plans to further invest in Latin America in the areas of technology, marketing and content, so the company’s subsidiaries can continue to serve consumers, exhibitors and studios at the highest level. Fandango is the ultimate digital network for all things movies, serving consumers with best-in-class movie information, ticketing to 32,000+ screens globally, movie trailers and original video content for movie discovery, and home entertainment. Its portfolio reaches more than 67 million unique visitors per month worldwide, with 210 million app downloads in the U.S. and Latin America, and includes popular movie properties Flixster, Rotten Tomatoes and the Tomatometer rating, and Fandango Movieclips, the No. 1 movie trailers and content channel on YouTube. Its new premium on demand video service, FandangoNOW offers new release and catalog movies and next-day TV shows on a wide variety of connected, over-the–top (OTT) and mobile devices. Also part of the Fandango family are Latin America’s leading online ticketers, Ingresso.com and Fandango Latin America (formerly Cinepapaya) – extending Fandango’s reach to Brazil, Mexico, Argentina, Colombia, Peru, Chile, Ecuador and Bolivia.